108 Bead Mala: The mala is an ancient spiritual tool that has been used for thousands of years to help keep accurate count of mantras during a meditation. The mala is made up of gemstones or beads that become infused with the energy that’s channeled into them through a mantra repetition. By wearing a special mala necklace or bracelet directly on the skin, you can keep the energetic properties of the beads close to you. Mala jewelry has become a physical symbol of spirituality worn proudly around the necks and wrists of spiritual devotees. 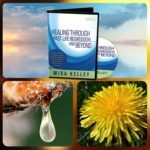 During meditation you can chant out loud, whisper, or repeat the phrase silently, tracing the beads of the mala with your fingers to keep track of the mantra. When done with your meditation, put the mala around your wrist and remain connected to your intention to stay open and balanced throughout the entire day. 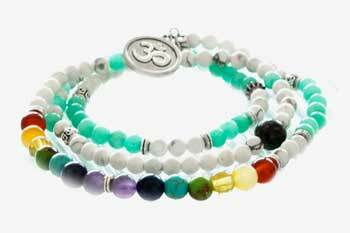 The Seven Chakra Mala has 108 beads. 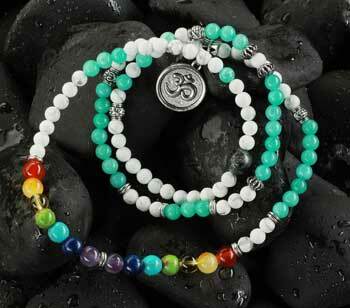 Each chakra is represented by a stone bead that corresponds to the chakra color. It is an elastic mala that you can wear around your neck or wrapped as a bracelet around your wrist. It is hand-made with 6mm beads. The OM Charm is made of zink alloy. 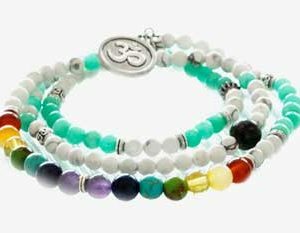 Set Your Intention: To open up and balance each chakra, to allow and receive Divine guidance and to bring a greater sense of balance and being Divine supported, attune the Seven Chakra Mala to your energy. Sit quietly. Hold your Seven Chakra Mala against your heart. Breathe in your intention for the jewelry and infuse it into your mala. And so it is. Your bijou is now ready to wear.